Centsible Savings: It's Free Chocolate Friday again! 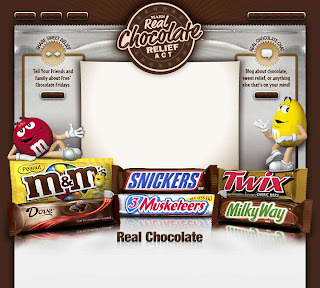 Have you gotten your coupons yet for some free chocolate? If not you can try again today! It's FREE CHOCOLATE Friday again!! Be one of the first 250,000 people to go here after 9:00 am and sign up and you will get a coupon in the mail for a FREE single-size package of M&M's, Milky Way, Snickers, 3 Musketeers, Twix, or Dove.